Thai Hand Knotted Serpentine and Leather Wrap Bracelet, "Sea Breeze"
Knotted by hand on brown leather cords, serpentine beads grace this casual bracelet by Thailand's Siriporn. 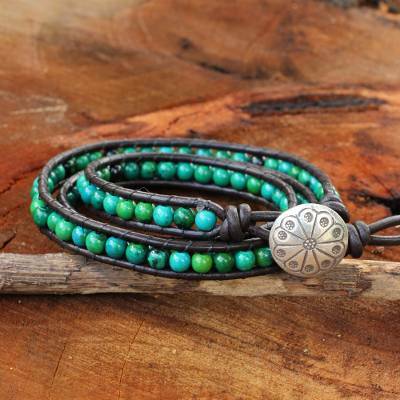 It wraps around the wrist and closes with a silver button from Thailand's hill tribe artisans. You can find serpentine wrap bracelet 'Sea Breeze' by Siriporn in jewelry categories such as Bohemian Bracelets, Serpentine Bracelets, Leather Bracelets, Silver Bracelets, Fine Silver Bracelets, Wrap Bracelets and Beaded Bracelets. Enjoy exploring these sections for other Novica treasures.